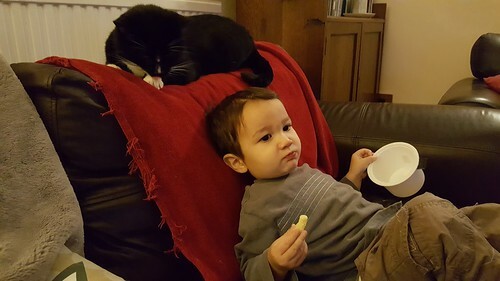 Keiki, eating cheese puffs & chilling on the sofa with his bestie, Telstar. Today he was obviously feeling much better, after 24 hours spent drinking milk and fruit puree and lying on top of Mummy. So he "helped" me while I dialed in to a telecon this afternoon. For twenty minutes he behaved beautifully, and then just as things were wrapping up, he started pounding the keyboard and managed to hit the mute button. Of course. My fellow participants were treated to ten seconds of me hissing, "No, Keiki, no, paws off," while he screamed "HAAAYYYYYY" randomly and joyfully at the top of his lungs, until I wrestled him to the floor, reached up and jabbed the mute button again. If you need me, I'll be in the corner, scraping together the shreds of my dignity. This entry was originally posted at http://nanila.dreamwidth.org/1055198.html. The titration count is at .0 pKa. I just wanted to wish you and your close and extended family a wonderful Thanksgiving. Random note: one of my cousins-by-marriage is half Japanese, half Native American. Her dad was born in an internment camp. Her mom on the rez. Recently, her daughter played a Pilgrim in the school Thanksgiving play. To paraphrase Cousin: You have to laugh, or you'll never stop crying.